The Sanden Eco® Plus Hot Water Heat Pump System has two of the most important qualities of every household system – energy-efficiency and environment-friendliness. This remarkable system is brought about by Sanden, a Japanese-owned international company that has established a strong reputation for innovative heating and cooling technology. With over 35 years of operations in Australia, they have successfully created systems that are meant to improve the standard of living in every Australian household. Their ventures in automotive air conditioning systems and commercial refrigeration and vending machines prove the versatility of their knowledge and experience in heating and cooling systems. 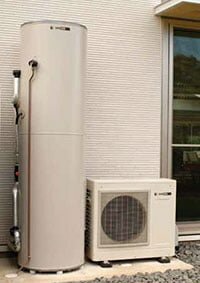 The Sanden Eco® Plus Hot Water Heat Pump System is only one of the many ways that they have revolutionized heating systems in Australia. This state-of-the-art system promises to help save up to 80% of hot water energy costs – and that is not an exaggeration. In 2010, a Sanden customer monitored their electrical consumption from the moment they switched from a conventional electric hot water system to the Sanden Eco® Plus Hot Water Heat Pump System. They are a family of 4 living in Sydney. After the switch, their consumption went down by 80% and it led to a reduction of energy cost from $129.08 to $30.12. This feat is made possible by the special heat transfer technology that makes this system unique. It uses minimal energy by moving heat from one location into another. The system uses an ozone-friendly natural refrigerant called R744 (CO2) to absorb this heat. This allows it to consume only 0.9 kW of electricity to generate 4.5 kW of heat that a conventional electric heating system usually requires. When this gaseous refrigerant circulates and passes through the compressor, both the pressure and temperature rise. This refrigerant goes on to pass through the heat exchanger where it heats the water. After this, the refrigerant goes back to the system while the heated water is pumped right into the storage tank. This process allows heat recovery to happen a lot faster by up to 50%. Because of this technology, the Sanden Eco® Plus Hot Water Heat Pump System is offered with one of the highest Small-scale Technology Certificates rewards – between 24 to 35. One STC represents a megawatt hour of renewable energy generation. The higher it is, the more it can be converted into cash rebate from the State. This can be considered a great discount for every buyer. The fact that this hot water heat pump system has the highest STC rewards should be proof that it is beneficial to the environment. Anything that uses renewable energy and consumes a minimal amount of electricity is already classified as something that can help battle a lot of environmental issues. The Sanden Eco® Plus Hot Water Heat Pump System’s use of R744 (CO2) as its refrigerant is another reason why this is very environment-friendly. This natural refrigerant has been tested to have zero effect on global warming since it is designed to reduce greenhouse gas emissions. This means it is not a threat to the ozone layer depletion. Not only that, this system does not add to the noise pollution. It has an impressive whisper quiet operation – making a noise that is only 37 dB. This makes it an ideal system to install anywhere without worrying about complaints coming from your neighbors. The energy-efficiency and environment-friendliness of the Sanden Eco® Plus Hot Water Heat Pump System should be enough proof of how remarkable this system can be. But that is not all that you can get from it. Apart from consuming less energy thanks to a High Coefficient of Performance (COP=5^), the heating pump unit comes with an automatic heating cycle that you can program during the off-peak tariff. This means you get even more savings without compromising the supply of hot water. It also has a Blockout Timer that you can use if you have an on-roof photovoltaic solar electricity system. This unit is weather resistant and can function regardless of the climate – with an operating range of (-10 degrees Celsius to +43 degrees Celsius). Instead of the vitreous enamel tank, this system is paired with a stainless-steel tank that comes in three sizes (160L, 250L, and 315L). It is made of high-quality 316 Marine Grade stainless steel cylinder that is fully insulated to avoid heat loss. It also has a safety pressure and temperature relief valve. The innovative heat pump system from Sanden is also made with a smarter split system. This means you can install the heat pump unit and the stainless-steel tank separately. Both of these come with a warranty, with the heat pump unit having 6 years warranty and the stainless-steel tank 15 years warranty. Without a doubt, the Sanden Eco® Plus Hot Water Heat Pump System is a class on its own. If you want high quality, energy-efficient, and environmentally friendly hot water system, you know which one is the best in the market. Read more about the Sanden Eco heat pump and download a brochure. Contact us today if you wish to make an enquiry.